This is great and super easy. I was looking for a quiche without the crust! I made it for my friends and they raved. 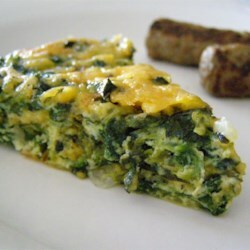 I am making it again today (Sunday) so that I can have it for breakfast during the week. Heats up great. I only use 2 cups of cheese (1 bag, shredded) any kind and I also had a little bit of fresh nutmeg.